Can't get enough chicken dinner. Now that summer is around the corner, grilling and barbecuing is in my mind and, I'm sure, to many others. This creamy and cheesy pasta recipe has bite-sized grilled chicken as a main ingredient. Should be fun and yummy to make for a small group of guests. Prepare chicken for grilling by brushing with olive oil and seasoning with salt and pepper. Grill in high to medium heat for about 12-15 minutes. When finished, chop chicken into bite-sized cubes. Cut broccoli into florets and steam it in a microwave oven. See here for directions. Boil shells in slightly salted water according to accompanying instructions. When finished, drain water and place shells on an empty bowl (ok to use the same boiling pot) with a little bit of butter. Grate cheddar and Gouda. Keep in mind that the finer the grate, the more likely cheese will melt and blend with sauce. In a saucepan, melt 1 tbsp butter. Add flour and whisk for a minute or two. Add cream and bring to a boil. Reduce to low heat and simmer for ten minutes. Slowly add in cheese while whisking. Season sauce to taste with salt, pepper, and nutmeg. 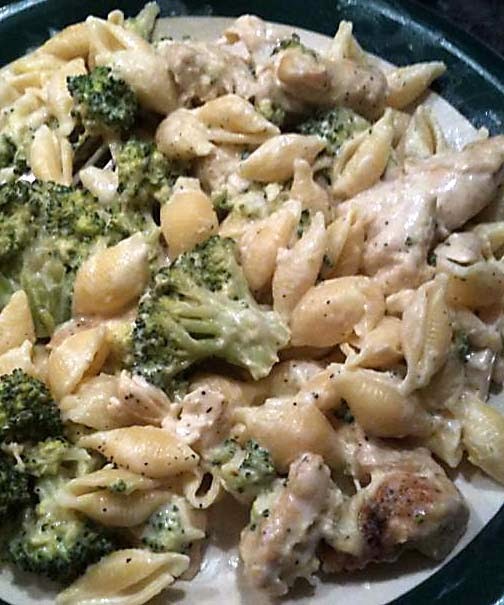 Add broccoli to pasta bowl / pot, and mix. Then add chopped chicken and sauce. Stir until evenly mixed.